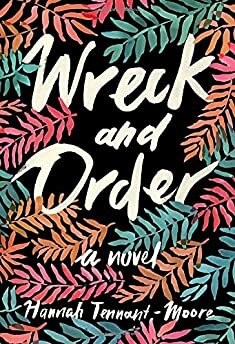 Largehearted Boy: Book Notes - Hannah Tennant-Moore "Wreck and Order"
Book Notes - Hannah Tennant-Moore "Wreck and Order"
Hannah Tennant-Moore's novel Wreck and Order is a clever and unsettling debut about one woman's path to self-discovery. "[An] astute, restless début...The novel glows with the malaise of the Bush years...Although Elsie makes rash decisions, her thoughts about intimacy and desire are searching and considered, and Tennant-Moore depicts even her most startling fantasies with analytical froideur." In writing my first novel Wreck and Order, I set out to draw the reader as close as possible into a particular woman's inner world. But I didn't want that innerness to exist in a vacuum. Music was one of the ways I opened up Elsie's experience, connecting her to the world outside her head. I recently had the pleasure of doing a reading of the novel interspersed with live music: I would read a section that mentioned a particular song and then the band would play that song. Hearing the songs played alongside the reading made their purpose clear: to relieve my narrator's painful—but also fruitful—self-awareness. The emotional power of these songs is straightforward and pure—a brief, forceful blast of feeling without analysis. Putting these blasts alongside Elsie's complicated inquiries into the way her heart and mind work is a reminder to the reader that when one pans out from any intense moment, one is left with basic human feeling. Songs—especially the popular hits I evoke in the novel—are like the primary colors of feelings. The writer can combine these colors infinite ways to make infinite shades, and in Wreck and Order, the reader is often looking closely at one of these particular shades. But music offers the suggestion that even the most specific emotion is linked to something elemental in being alive. With her combination of earnestness and self-deprecation, Phair sings about her obsession with a man who is violent and controlling: "He knocked me down, started dragging me around… And I liked it. I liked it more and more." In writing, this kind of unexamined confession is not enough for me, but since music communicates to the listener with much more than words, the lyrics need not be intricate or profound; the sound of Phair's voice offers a non-cerebral understanding of her obsession. I evoke "Johnny Feelgood" in a passage where Elsie examines her "need to do violence to [her] love;" the song is a subtle reminder that this impulse, however disturbing in Elsie's enactment of it, is far from abnormal. Elsie listens to this song in the car with her father in high school, the two of them playing hookie from school and work. The song is full of adolescent angst and the naïve dream of escaping suffering through greatness—in this case, by becoming a famous rock star. The line that speaks to lonely adolescent Elsie is "Destiny, protect me from the world." One of Elsie's main shortcomings is that she wants her life to be special, to be different from every other adult life she knows, but she doesn't have any idea what form this difference will take. So she rejects the conventional pathway to a stable, happy adulthood for privileged young millennials: she's very smart, but doesn't go to college; she's passionate and craves intimacy, but doesn't want a monogamous relationship or a family; she's intellectually engaged and curious, but does not pursue a realistic career. The novel traces her journey to find her own way to be okay in the world, away from the pathos and longing of songs like "Anyone Can Play Guitar" into an authentic, immediate experience that has nothing to do with seeking the world's approval. Elsie's high school boyfriend plays this song for her in his attic bedroom, as she lies in his bed wearing only her underwear. The scene is intentionally maudlin in the way of childish puppy love; I chose "Is This Love" precisely because I find it to be a corny, trite song. But as Elsie's romantic life evolves into deeper and more complicated entanglements, the reader is made to feel the appeal of the corny and the trite, particularly in matters of the heart. This song plays as Elsie is falling asleep the first night she arrives in Sri Lanka, in a room she's sharing with a Sri Lankan woman and her two sons. The woman, a single mother who works long days, keeps the radio in her room tuned to a station that plays American pop. The lilting 80s sound of the Bangles' longing for something as simple and silly as a "fun day" seems incongruous with Elsie's surroundings, a modest, crowded room in the mountains. The song provides just the tiniest hint of how little Elsie understands about this culture, how nothing in her life—not even a familiar song—has any context here. Elsie invokes this Sesame Street song ironically, mocking her melodramatic mother who used to sing the song in a way "that came across as unhinged and desperate even to a child." But the frank, calm acceptance the song advocates—"It's all right to feel things, though the feelings may be strange. Feelings are such real things, and they change and change and change"—could actually help Elsie simplify her responses to external events. During a talent show at Elsie's junior high, popular girls with perfect GPAs sing this song about doing whatever it takes to please a man and keep him satisfied. The performance is supposedly ironic. But Elsie finds that the cultural message the song advocates is still alive and well: it's up to women to make relationships work, to foster and protect intimacy.